The Woolworths Museum has had a makeover, with a new layout and lots of new content. The new 'responsive' styling makes it easier to navigate the site from a phone or tablet, while still giving a rich, multimedia experience from a desktop PC. It's also much faster. For the first time it supports compression, and every page has been optimised for speed, thanks to Google's lossless compression and PageSpeed technology. There's a new menu at the top of every page, making it easier to find the dates or ranges that interest you. It also incorporates an interactive search tool, which can pinpoint search words or whole phrases in a single click. Our jukeboxes and cinema have adopted the latest HTM5 standards, and include media in formats to suit all of the leading browsers. Closed captions are available for the films to make them more accessible. We continue to add new photos and features. This will allow us to celebrate more of the North American heritage, particularly in the inter-war and post-war periods. We hope you like the changes and invite your feedback and suggestions for further enhancements. 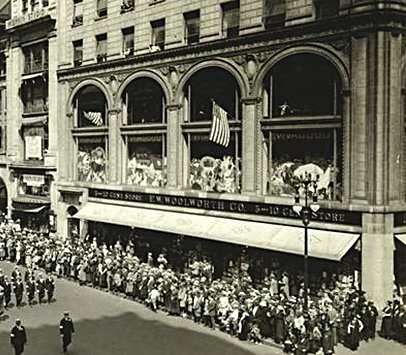 The 5 & 10¢ store pioneer Frank W. Woolworth had found himself trapped behind enemy lines when the First World War had broken out in Europe in 1914. On his return to New York he told all who would listen of the suffering that he had witnessed on the long journey home. The Conflict presented a big challenge in-store. Many of their best-selling lines had traditionally been made in Europe, like needles and notions from Birmingham, England, and toys, dolls and decorations from Berlin and Bavaria. To replace them, Frank hand-picked local suppliers and showed them how to gear up for mass-production, financing the equipment to get them started and placing large orders upfront. In doing so he was able to leverage the knowledge he had acquired by always insisting on seeing the production line when buying in Europe. But none of the home-grown notions so boldly featured in the store windows could match their runaway best-seller in Summer 1917. The 995-strong chain sold half a million copies of the 10¢ 80 rpm gramophone record, 'Over There', marketed on the Little Wonder label that it had developed exclusivly with Henry Waterson. It is said that the patriotic melody gave solace to families who had waved their sons off as they embarked for the long Atlantic crossing to an uncertain fate on the battlefields of France. "Tell your sweetheart not to pine, to be proud her boy's in line". Frank's endeavours drew attention from the highest in the land. In June 1917 he was summoned to the White House for a meeting with President Woodrow Wilson. The Commander-in-Chief invited Woolworth to apply his marketing expertise to head fund-raising for the war effort. At once he abandonned his vanity projects, dropping work on an autobiography, and delegating the detailed supervision of his 'swankiest ever dimestore', a spectacular thousandth branch at the heart of the world's premier shopping street in Fifth Avenue, New York. Swallowing his pride, he even enlisted arch-rival Sebastian S. Kresge to help with his mission. Meanwhile, across the Atlantic, the British subsidiary had been forced to batten down the hatches. Its Directors had appointed women to take the helm as their Managers went to war, avoiding the imposition of press-ganged men from the 5 & 10¢. Many went on to serve with great distinction. But women couldn't replace the Builders who had driven the pace of store openings until 1916. 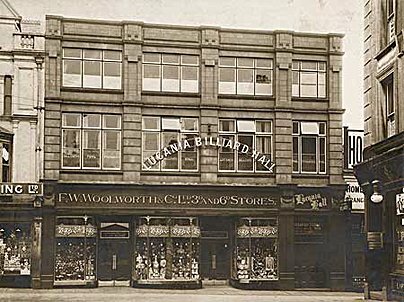 By 1917 ambitions to open a hundred stores within ten years had been scaled back, with just single opening. Aberdare in Welsh Glamorgan took the total to seventy-five. Mansfield, Branch 100, would not open until 31 July 1921. The 1924 Dawes Plan paved the way for a Buying Office in Weimar Germany and massive new warehouses in Fuërth and Sonneberg to process the huge quantities of Christmas Decorations, Toys and Housewares sold in North America, Cuba and the British Isles. Then, in 1927, barely a decade after the USA had gone to war, Executives launched a new subsidiary with a store at 26-28 Fallenstrasse in the northern port city of Bremen. Its fixed prices of 25 & 50 Pfennigs were four times the 5 & 10¢ maxima, and three times the British rates, opening the way for a more up-market range. The stores proved an instant hit. They had become so firmly established that they were able to stand alone when a new political scene outlawed foreign control in the mid 1930s. 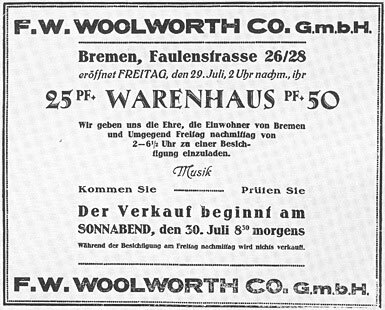 Unlike the English-speaking chains, Woolworth GmbH survived a brush with death and is growing once again, with over 400 stores today, including seven in and around Bremen, preparing to mark their eightieth birthday. By 1937 Europe had once again become a tinderbox. US investors, whipped into a frenzy by a travelog showing "Adolf Hitler teasets for 50 Pfg" in Woolworth's windows in Berlin, complained they would never see a dividend on the multi-million dollar German profits that were frozen in the accounts presented at the AGM in Watertown, NY. Fortunately local sales and profits had rocketed, thanks to the higher priced merchandise introduced since the price limit had been abandonned. In Britain, despite the rumblings on the Continent, profit had never been higher. The chain had grown to almost seven hundred outlets, almost doubling in size since 1930. It dominated the retail scene, allowing it to force suppliers to operate within its sixpenny limit. 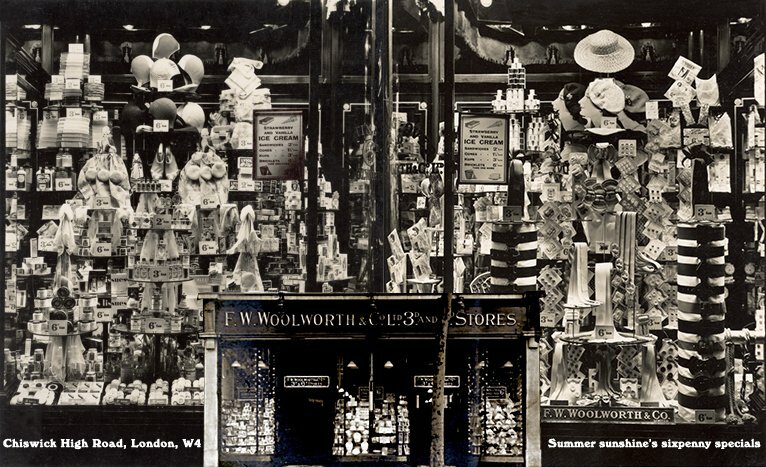 As Spring turned to Summer every store displayed "sixpenny specials for summer sunshine" including rubber bathing caps, sun creams, scarves and a broad range of toiletries ready to pack conveniently into a suitcase for the holidays. Closer inspection would reveal that some of the sixpenny lipsticks and balms were unusually small, government tax would double the price of a pack of playing cards to a shilling, while the front, back and lense of their popular VP twin cameras were each sold separately, making the finished item a shilling and sixpence, or three times the official maximum. Despite jokes to the contrary, few shoppers were "hopping mad" at the fact that socks and deck shoes were sold individually at sixpence a foot, knowing that they were still great value. The Buyer had resisted the temptation to sell sunglasses by the eye, instead embracing the new wonder-material, bakelite for the frames, and giving them the style of swimming goggles. They were sold from a display card which boasted that the lenses were made from the finest glass and that sixpence would protect the eyes from injurious rays! 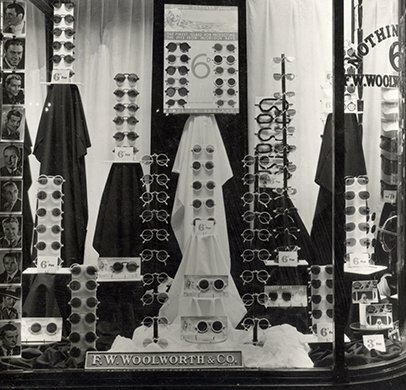 To add extra zing to the display and treat the sunglasses as a designer fashion accessory, stores were encouraged to display threepenny film star fan cards at the side of the window. At the time, one of the featured stars, Cary Grant, was making the movie Bringing Up Baby in which he and and Katherine Hepburn placated an angry leopard by singing "diamond bracelets Woolworth doesn't sell, baby". And just five years later, with the world at war, he married Barbara Hutton, who famously proved that money can't buy love, squandering the multi-million dollar fortune she had inherited from grandpa Frank W. Woolworth.